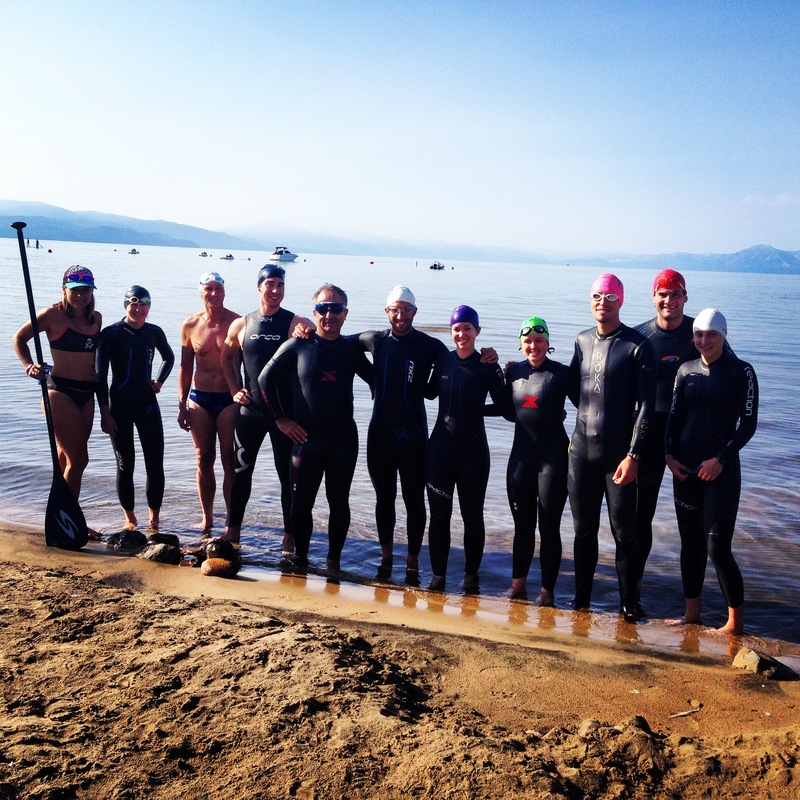 Week 32: Ironman Lake Tahoe Course Preview Weekend – Where's The Tofu? 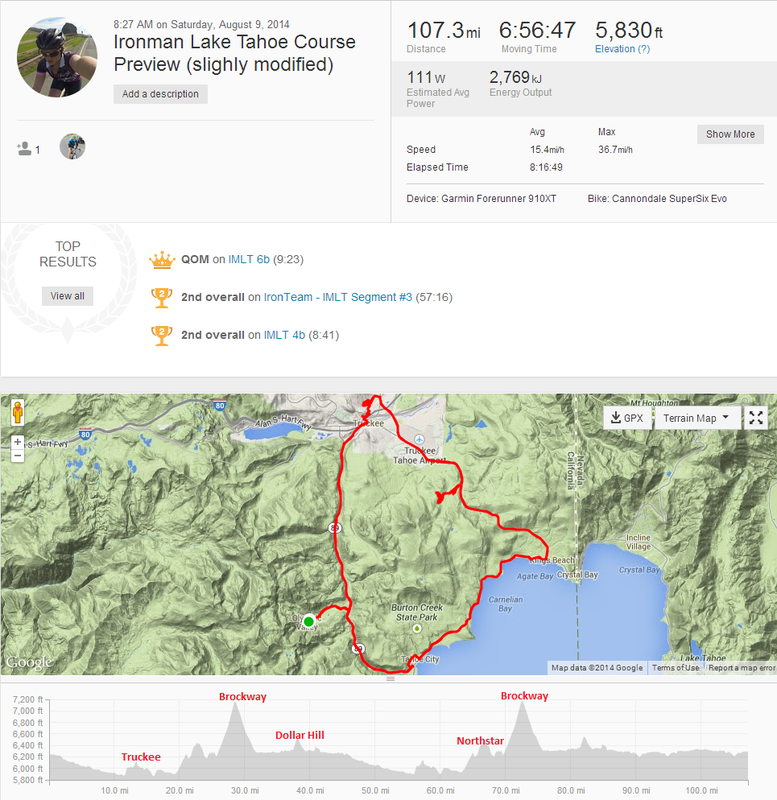 One of the reasons I signed up for my first Ironman in Lake Tahoe (as opposed to other destinations around the world) is because Tahoe is only a ~4 hour drive from San Francisco and I can preview the course. Gaining insight into the hills, the terrain, the ins-and-outs, the turns, and the nuances helps build tremendous confidence and knowledge for race day. 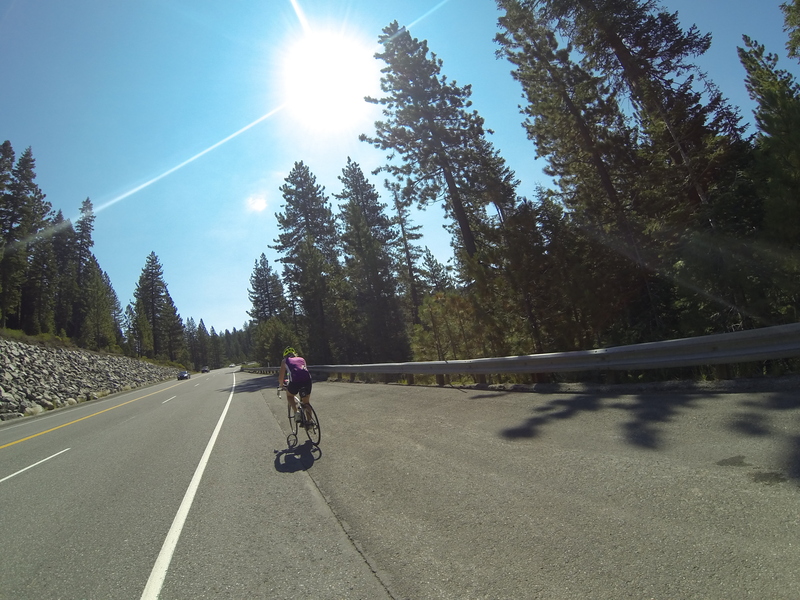 This was my fifth trip to Tahoe this summer and I think it will be my last until Ironman. We did a 3-day training ‘camp’ to preview the swim, bike, and run courses and I’m ready to get this party started. Is it September 21st yet?! Before I recap the weekend, just want to give a shout-out to Coaches Duane Franks and Dorette Franks, Megan, and Dave for your incredible support during our trainings. You knew exactly what I needed (nutrition, water, baby wipes, etc) and were on top of everything. Also, if it hadn’t been for you guys my bike ride would’ve only been 56 miles on Saturday. Thank you so much for your hard work and preparation for a GREAT weekend!! The 3-day training weekend started with a shorter run on Friday evening after a long and slow drive to Lake Tahoe. It felt like a sauna outside and I was really tired from the drive so I wasn’t exactly looking forward to running for an hour. But I did it anyway (obviously). It was a slow 6 mile run near gorgeous Donner Lake which was just enough to work up an appetite for an authentic Mexican dinner with Mike and Tami! 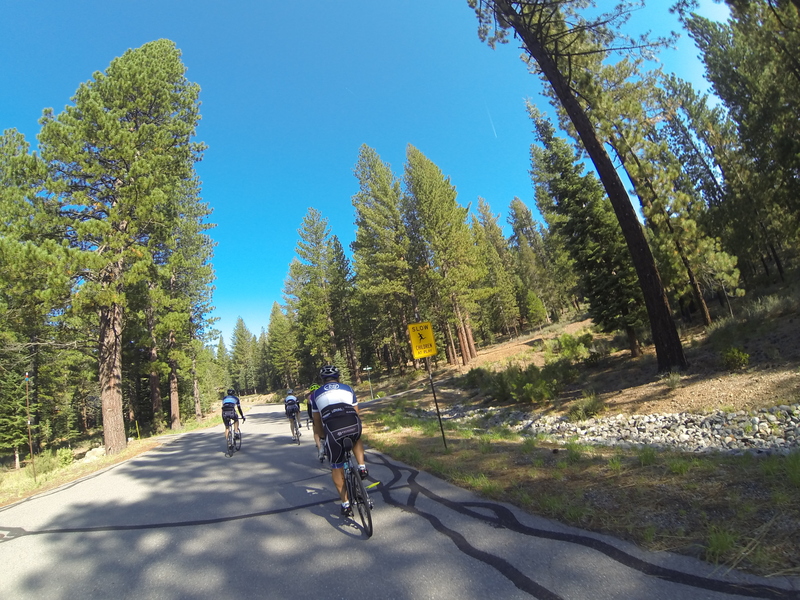 Saturday we woke up bright and early to meet our training group at 7:30am at Squaw Valley Resort for a ~110 mile bike ride along the actual Ironman Lake Tahoe course. After an overview from our coaches, a weigh-in (more on that later), and a nutrition lesson, we were ready to start our ~7 hour bike adventure! The beginning of the ride was flat-to-downhill and we were flying! It felt amazing and was a great way to get my legs (and body — it was 40 degrees at the start) warmed up for the inevitable climbing to come. We meandered through Truckee neighborhoods, dodged cars downtown, and finally found ourselves at Northstar Resort. This was part of the course I hadn’t seen before and it was a lot longer and hillier than I was expecting. The Northstar section wasn’t horrible the first time around, but there are quite a few turns and 2 or 3 short burst hills that are enough to drain your legs if you don’t pace them right. 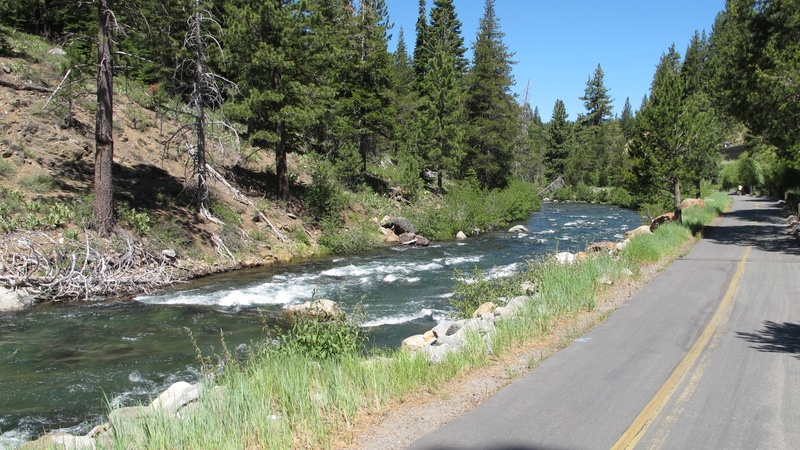 Truckee neighborhoods — so beautiful! After Northstar we got back on the main road and immediately started the dreaded Brockway Summit climb. I actually don’t mind this climb too much, and I like how Northstar breaks up that section so it doesn’t feel like a constant slog fest. I also like to break the Brockway climb into sections for mental prep. For example, there’s a sign that says “Passing Lane 1/2 mile”. I know that once I get to that sign I’m only 1 mile to the top. And I also know that once the passing lane ends I’m almost to the speedy downhill! I reached the top of Brockway (2.9 miles, ~1000 ft of elevation gain, 7,200 ft above sea level) about 26 minutes later and cruised downhill, very controlled and off in the shoulder to avoid cars. Then almost at the bottom of the hill about 100 feet infront of me I see Jesse’s bike tumble to the ground! Jesse could smell burning from his back tire, so within seconds he unclipped from his pedals and jumped off his bike and onto the shoulder, all while descending at 20+ miles per hour. I almost didn’t believe what I had just seen. Was Jesse secretly a stunt double training for his upcoming movie? What in the world was that!? Tami was right behind him and luckily she didn’t go down with him (Tami had her own little fall just a few minutes earlier!). I stopped to make sure he was OK and miraculously he wasn’t broken. Not only was he OK, he was completely un-scratched, un-harmed, and didn’t even hit the ground! He flew off his bike with the strength and grace of a gazelle and emerged with a smile. Un-freaking-believable. Luckily Jesse is smart and didn’t risk finishing the ride as his bike frame may have cracked. Well done, Jesse. Teach me your ninja ways. And we’re all glad you’re safe. After the incident I was pretty shaken up and took the rest of the ride with extreme caution and attention. There were cars and heavy traffic everywhere so staying attentive and riding predictably was essential. 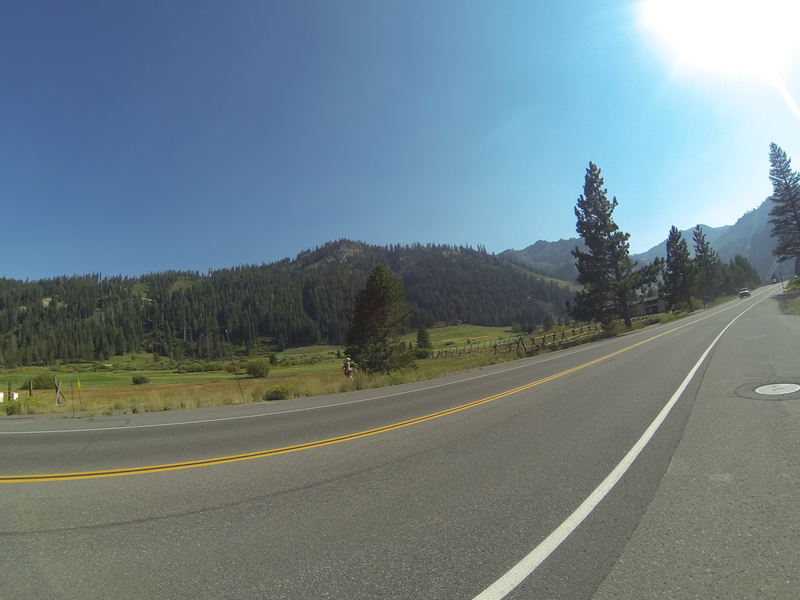 Continuing on, we followed the course through Kings Beach then eventually to Tahoe City where we came across a slight detour off the main road. There was a very steep and very annoying hill on rough road that you have to conquer three times during the race. Oh boy. I’m glad we had a chance to see this because the hill barely shows up on the elevation chart and nobody talks about it, but that third time isn’t going to be fun whatesoever. We were officially done with the first lap (the course is 2.3 laps in total) and feeling good. I was eating Bonk Breakers and drinking Skratch Labs for the first half of the bike before turning to Shot Bloks + Skratch during the second half. When we got back to the Truckee neighborhoods I started to hear a weird sound from my bike wheel. Uh oh. I was in a safe spot so I stopped, got off my bike, and found my rear wheel almost completely flat. Nooooooo!! I have tubeless tires so dealing with flats is extra annoying, but almost never happens. Two friendly guys stopped to help me, but what we realized was that my tire was actually completely destroyed. Donezo. No mas. There was visible damage everywhere. I was frustrated but determined to find a solution to this!! I called our support crew, Coach Dorette, and she drove to my rescue while Coach Duane biked over. Part of the support crew helping with my tire. Thanks guys!! We thought about everything — putting Duane’s tire on my wheel (probably wouldn’t work because my wheels are meant for tubeless) — putting a new tube into my existing tire (nope, my tire was destroyed and not rideable) — so finally we tried taking Dorette’s wheel off of her bike and putting it on mine. The only risk was that her cassette wasn’t going to jive with my derailleur. But we tried it anyway and it worked!! I shifted all the way up and all the way down and everything seemed completely fine!! Thanks Duane and Dorette!!!! If that had happened during Ironman I would’ve been completely done, unless the support car had a new tire onhand. The frustrating thing about all of this is that I went to my bike shop a few weeks ago to buy new tires because I could tell they looked worn down and the guy said I still had at least 1000 more miles left on them!!! Ugh. Oh well. I went back last night and bought new and very durable tires. I got back on my bike and rode the remaining 50 miles pretty much by myself. I was happy to be back riding again and finishing what I had started. 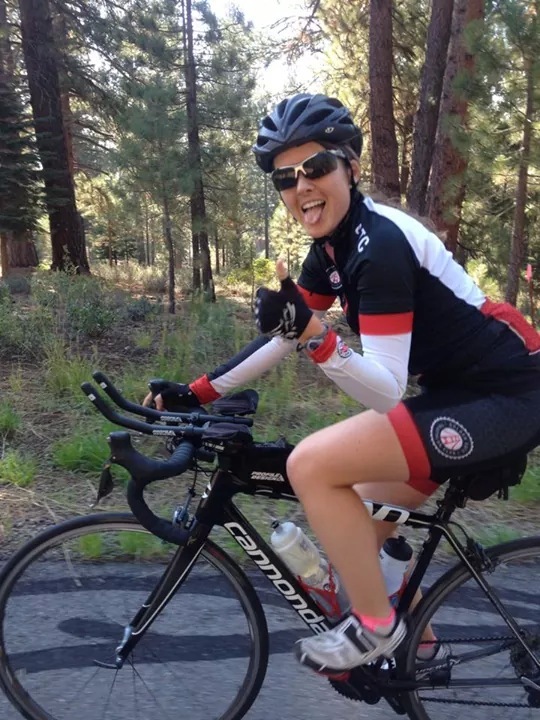 The second time up Brockway was pretty challenging, but I kept reminding myself about all of the crazy bike rides I’ve done (Death Ride, Alta Alpina, etc) and how I can do ANYthing! At mile 77 I had my second weigh-in and found out I lost about 4 pounds of water. That was pretty eye-opening for me and made me realize how dehydrating the mountains are, and how much extra fluid you have to consume. I need to do a better job of this! I finished the ride in about 7 hours and felt really happy to be done. Overall, the bike course is extremely challenging with the climbing at altitude but I’m glad I at least know what to expect. As Coach Duane told us about the Ironman Bike Leg: “pace, don’t race”. 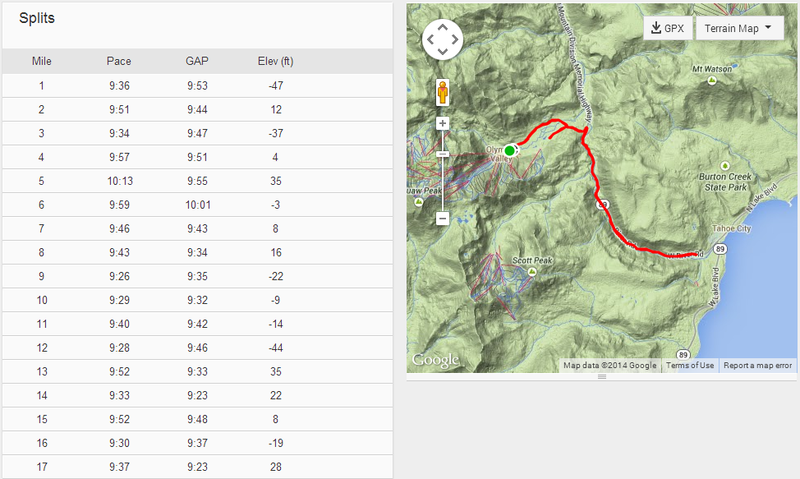 Note: I did 2 loops of the course starting at Squaw Valley and did a 16 mile out-and-back going South on 89. This is slightly different from race day which will start at Kings Beach and do 2.3 loops ending at Squaw. Sunday — Run Course Preview — AMAZING!!! I woke up on Sunday morning and I had only one thought: “Volkswagen”. (see video clip from Happy Gilmore). It’s the word I often use to describe how my body feels after waking up the day after a tough training ride. I wasn’t feeling well, I had a slight headache, my body ached, I was very hungry and unbelievably thirsty that morning. I thought I had taken care of myself pretty well but obviously I needed to eat, drink, and stretch more! 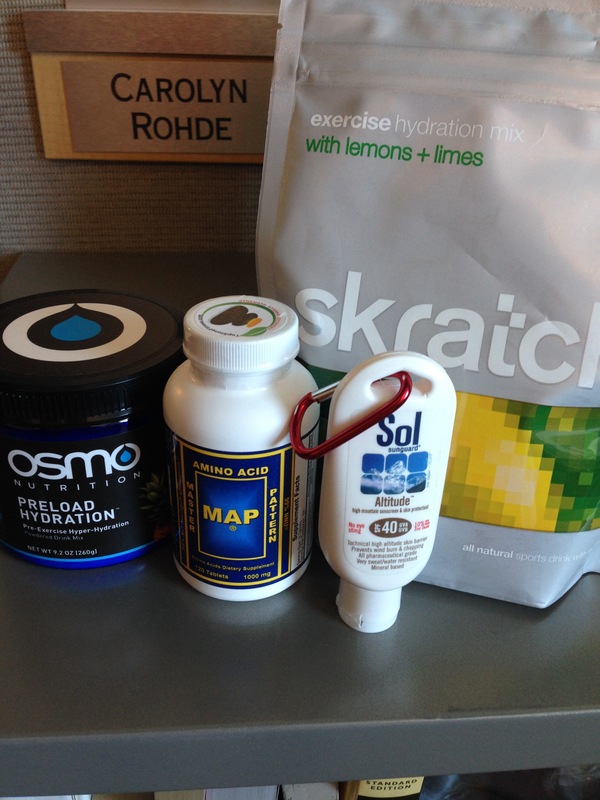 I was also a little nervous for the day ahead — an open water swim plus a 17 mile run at altitude is HARD. I was worried my body wouldn’t hold up or I would fall apart somehow (spoiler alert: I actually felt like a superwoman.) So I chugged a glass of Osmo Preload, had a big breakfast, and started the day. After a short swim at Kings Beach and clinic on transitions from our coaches, we made our way to Squaw Valley to start the run on the actual Ironman run course (the course is a double out-and-back so we were able to preview all of it by ‘only’ doing 17 miles since the final 9 are on the same roads). I remember turning to Jesse and saying something like “I normally love running and super positive, but I’m just not feeling it today.” Looking back, I think I was more intimidated by the distance than “not feeling it” physically. Coach Duane told us to start the run ’embarrassingly slow’ and then run the 2nd half faster than the first. I tried but I had a hard time running slower than my marathon pace (~9:45 – 10:00 min/mile). It actually is hard to run slow! Once I took that first step I almost immediately felt better. Those aches, that headache, that intimidation, all were gone. I just put one foot infront of the other, started chatting with Jesse’s girlfriend, Taylor, and settled into my happy pace. After a couple miles I felt warmed up and started pushing the pace a little. I sipped my Skratch Labs, popped my Shot Bloks, took in the beauty around me, sang songs in my head (no headphones) and focused. The course is mostly flat with a few rollers and absolutely, 100% the most gorgeous run I think I’ve ever done. The entire run course is a shaded multi-use bike path and starts off with views of jagged mountains and vacant chairlifts. Then at about mile 4 you start to run along a beautiful creek where people are fly fishing, swimming, and having a blast. The creek is stunning!! I couldn’t stop looking at the water crashing into rocks and flowing downstream. And I thought for sure I would see a bear catching fish! The running route. Not too shabby! I felt so strong out there for the ENTIRE 17 miles. I was so happy, extremely positive the whole time, and kept a pretty consistent average pace with the 2nd half faster than the first. I also ran faster than I was expecting (9:43 min/mile average). Before the run I thought I would do about 10:30 – 11:00 minute miles because the altitude usually slows me down by a minute or so per mile. So I was just really surprised that I was able to keep my ‘sea level’ marathon pace in tact. Must be getting stronger!! This run was a huge confidence booster for me. I don’t know why I was so intimidated by the distance! I think it probably has a lot to do with a higher chance of something going wrong — cramping, upset stomach, exhaustion, lack of fuel, fatigue, etc. But I’m stronger than I think. I’m more prepared than I think. And I’m more well-trained than I think. And I just have to trust that on race day! I spy Tami on the run course! The New York Times. Advice from a Vegan Cardiologist. The president-elect of the American College of Cardiology is vegan!! That’s huge!! Everyone is all up-in-arms about it but seriously people, going plant-based can save your life. Vegan Oktoberfest. Beer + sunshine + delicious vegan food?? Road trip!! Who’s in? VegNews. McDonald’s Japan Launches Tofu McNuggets. I don’t eat fast food normally (except Chipotle obviously!! ), but it would be great for road trips to have more meat alternatives. Ironman.com Swim past the “OK” plateau. I’m definitely in that spot right now! My swim is ‘good enough’ to get me through the race so I’m focusing more on biking and running. Jesse is definitely a gazelle-like stunt double. So happy to meet you this weekend! Running at altitude killed me. I’m by no means a gazelle or a stunt double, but I’m incredibly lucky to have escaped unscathed. Great post – you’re crushing it, and your progress over the past few years is inspiring. Keep up the great work – 5 more weeks! Did you register for North Face 50K this week? Have fun in Detroit! You’re the best peer pressurer ever! Haven’t signed up yet but I might! Just landed in Detroit for a muggy training weekend. Good luck at the half!